From bare-bones functionality to almost unimaginable luxury, today's tubs offer a dizzying range of styles, features, sizes, and materials. Here's how to navigate the bubbly waters and find the perfect tub for you. Equal parts meditative and functional, today’s bathroom has been transformed into a spa, a place to unwind and refresh the body. Situated at the heart of this relaxation center is the tub. Once a utilitarian device, the tub has become a glamorous and, in many cases, exciting feature in bathroom design. These days, when it comes to choosing a tub, the possibilities are nearly limitless. Options include soakers and whirlpools; classic claw-footed models; contoured shapes, ovals, squares, and rounded; tubs with neck rests and armrests; tubs set into platforms; and tubs you step down into—or even walk into. All this variety comes at a price, so it’s important to remember that the total cost of a tub will reflect the amount of technology involved as well as the type of finish and material. “It used to be that bathtubs were just a tub-and-shower combination, with the primary goal being showering and cleansing the body. Today, bathtubs are often separate from the shower, with the sole purpose of soaking to relax and unwind,” says Gray Uhl, director of brand education at American Standard. Buying a tub is no longer a simple decision, and because a tub can be an expensive and permanent purchase, it is very important to do the research before you actually buy. Before shopping for a tub, first ask yourself how you like to bathe. Do you prefer a long lingering soak, or an invigorating whirlpool massage? Factor in how important bathing and other uses of a tub are to you and your family. Taking this opportunity to evaluate your goals and lifestyle before choosing a tub can be well worth the time investment. Fiberglass: This is a lightweight, moldable material. A fiberglass tub is the least expensive type you can buy. Unfortunately, it’s prone to scratching and doesn’t wear well, lasting about a dozen years. Fiberglass with an acrylic finish will hold up longer. Porcelain-Enameled Steel: This is a steel-based material covered in porcelain enamel. The result is a low-cost, smooth, glossy, and durable finish that is easy to clean. Enamel-Coated Cast Iron: This classic material will endure as long as your house stands. Because of its heavy weight, especially when filled with water, it is not recommended for large soaking tubs, and it’s best used on ground floors. Acrylic: This is a type of plastic featuring a high-gloss finish and excellent durability. Solid acrylic is a mid-price-range product that is more durable than fiberglass. Another plus: Scratches are less noticeable because the color is solid all the way through. Because it is easy to mold into shapes, acrylic is a popular material for uniquely shaped whirlpools with molded armrests and other detailing. It’s also lightweight, an important feature in large tubs that can put damaging stress on structural elements. The two most common tub sizes are 60 inches long by 30 inches wide and 60 inches long by 32 inches wide. A standard rectangular-shaped tub, however, will have a smaller dimensioned bathing well, measuring 55 inches by 24 inches at the top and narrowing to 45 inches by 22 inches at the very bottom. These are general bathtub dimensions for both cast iron and fiberglass tubs. When you’re shopping, be sure to choose a tub with a drain in the correct location, either left- or right-sided to correspond to your tub faucet and shower placement. 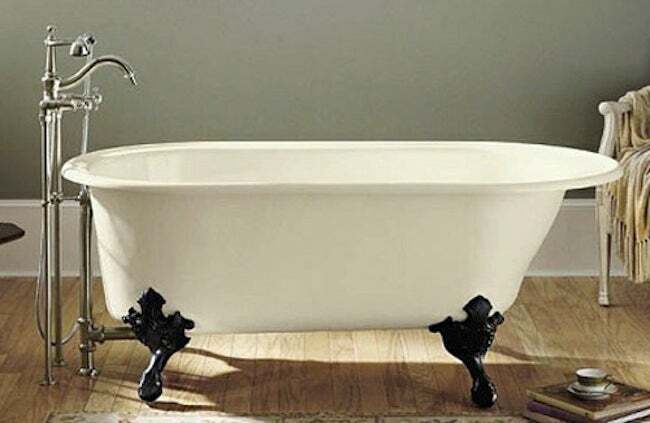 Popular since the 1800s, claw-footed tubs are very traditional. They are often generously scaled and typically made of cast iron. This style is usually expensive in part because of the porcelain enamel applied to the exterior and interior surfaces. Unlike a standard tub, a freestanding tub is not surrounded by cabinetry or built into an alcove. The tub may stand on feet, or be skirted or encased with custom-built panels and a stone, tile, or marble deck. 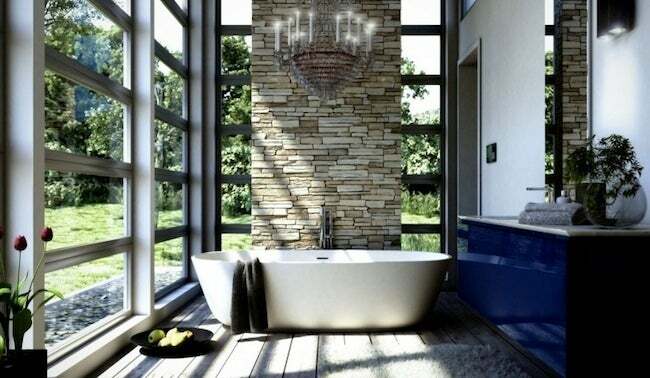 Designed to be self-supporting, this type of tub can serve as a luxurious focal point for any bathroom. Soaking tubs are usually deeper and wider than conventional tubs; some units are as long as 6.5 feet and sized to accommodate two adults. Soaking tubs can be found in many different styles, from the classic enameled cast iron Victorian style claw-foot to ultramodern acrylic vessels. Models can weigh between 225 to 2,000 pounds, not including the weight of the water, which can be significant—soaking tubs require 50 to 80 gallons of water at 8.3 pounds per gallon. Heating the water can also be an issue. A hot water booster can be installed to augment an existing water heater or, in some cases, an on-demand heater may be necessary. A popular choice today is the sunken whirlpool tub, which comes with an array of therapeutic and relaxing options in the form of multiple jets or single jets that are installed in the walls behind the tub. You can also choose from a wide assortment of sizes, shapes, and colors, including models that fit into the standard 5- to 6-foot tub space. Among the more basic types of whirlpool baths is the hydromassage, which uses a pump to recirculate bath water out of several jets strategically located in the tub walls. Another is the therapeutic air massage—or “air bath”—that features an air system that encases the tub, engulfing the bather with thousands of gentle bubbles that pour in from small holes in the bottom and sides of the tub. Manufacturers like American Standard, Jacuzzi, and Kohler offer luxury systems with a combination of both massaging jets and soothing air bubble systems in one unit, as well as baths equipped with heaters that warm the air before it enters the tub. If you’re in the market for a whirlpool tub, you’ll want to choose one that features a quiet yet powerful pump motor, is UL listed and approved, and has a removable front apron for easy access to internal parts and maintenance. For seniors, or anyone with mobility issues, the walk-in tub offers a simple solution that combines safety with revitalizing hydrotherapy. Walk-in bathtubs come in several convenient sizes and can even be installed in a standard bathtub space. The tub includes a comfortable, chair-height, built-in seat and a grab bar for added security. Jacuzzi offers a walk-in bathtub with their patented PointPro jet system, featuring high-volume, low-pressure pumps with a perfectly balanced water-to-air ratio to massage thoroughly yet gently. They’re arranged in precise locations that deliver a therapeutic massage and are fully adjustable. American Standard’s walk-in bathtub offers options like whirlpool, air spa, and combo massage systems. The tub also comes with a special Quick Drain feature that incorporates a powerful pump that removes bath water in less than two minutes.